"All products have been thoroughly tested for faults by an authorised company that specialise in refurbishing electrical goods to 'as new' or 'graded' condition." So someones run a wet wipe over it. I thought it was a handbag. Managed to get one used like new 2017 version for £24 Amazon warehouse. I got one of the free ones. Used it for an hour and been in a cupboard since. I did too for just over £14 after 20% off. Box was sealed so brand new. Bonus! Lmao that was exactly my thought. Is this some fancy Handbag?! 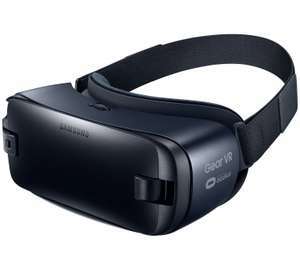 No it's a Virtual Reality headset for Samsung phones. You can currently get the next generation one with the controller for £54.99 from the Argos eBay shop, also refurbished. This one is S8 & S8+ compatible. It's not Note 8 compatible. Is this likley to work with other phones such as the iPhone 6+? Does it work with s6? Yes. I carry my chiauha in mine.